SCHOOL TALK is the only on-going, weekly, television/satellite/internet talk show with experts and recognized leaders, dedicated to covering contemporary issues related to EDUCATION. For over 20 years, this non-profit group has brought education to the public, and provided an archive of videotapes for professional development. The purpose is to inform, inspire, and encourage involvement in, and support for EDUCATION, the foundation of society, and the largest budget item in most communities. It brings us face to face with issues affecting us locally, nationally, and globally. The Video libraries provide a catalyst for discussion among education professionals, parents, and the community. These interviews, featuring leading experts in education, government, psychology, and business will foster teamwork and strategic problem solving in your school. A simple printed guide to usage accompanies each video. A brief introductory video on usage is also available, free of cost. In some states, professional development credit may be obtained directly from School Talk, Inc. Through viewing these thought-provoking video presentations, you will gain new insights, raise deeper questions, and develop more informed opinions for effecting change. They provide elements necessary for a contemporary approach to professional development, i.e. choice, relevance, and flexibility of use. 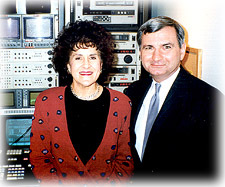 Production and editing is provided by Bridgewater State University; at The John Joseph Moakley Center television studio and the George Mason University Television studios.